Heating your water with an electric water heater is simple and efficient. Marathon water heaters are non-metallic tanks which means your water heater will NEVER rust out. The Marathon has at least two inches of polyurethane foam insulation around the entire tank - top, bottom, and sides! An electric Marathon water heater offers many advantages over propane or natural-gas units. First of all, the water heater is made from polybutylene. The tank will never rust out and will look good even in a damp environment. The water heater is bowl-shaped on the bottom to permit complete drainage of scale and sediment. An electric water heater is simple to install because it requires no gas piping or chimney. Renville-Sibley offers incentive rates to make electric water heating your safest, most efficient water heating source. Marathon water heaters come in various sizes and capacities to meet your every need. 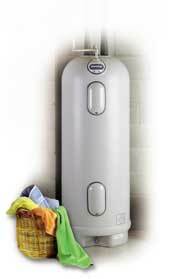 $820.00 (plus tax) cost to purchase a 105 Gallon Marathon Water Heater after rebates. $720.00 (plus tax) cost of Marathon for new construction or fossil fuel conversion for 105 gallon model. Must be connected to load management system.